15 years ago, Daiichi Yachiyo Maru, a cargo ship, was crashed into a large iceberg in northern the Pacific Ocean, and sank. The captain and a crew were died. Now, in Nishitama, a ship designer of Yatsushiro Shipbuilder, which belonged to Yatsushiro Financial Combine, was suffered from a sudden hart attack while he was driving, and died in a traffic accident. Six months has passed since then. 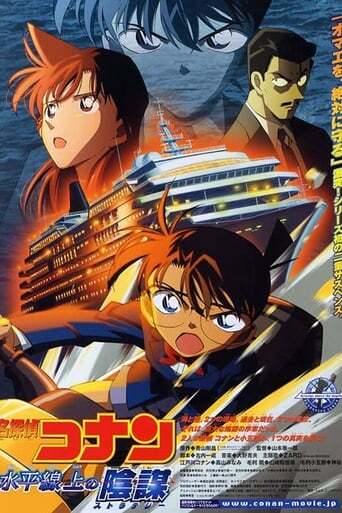 Conan, Ran, and Kogoro are enjoying their trip in the Aphrodite. The Aphrodite is a luxury liner, and it is sailing for the Pacific Ocean as its maiden voyage. However, there is a suspicious person, and finally a murder occurs. It is the beginning of a horrible plot occurred in the ocean where there is no place to escape from.